Last Friday I received an email that every aspiring writer hopes for - one of my short stories had been accepted by a magazine. I was thrilled and couldn't believe it that someone out there likes my work. This is my first short story to be published and I hope it's not the last. 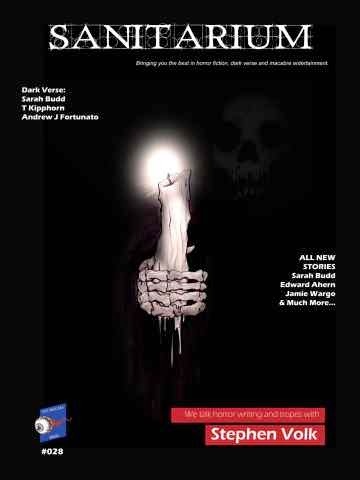 You can read my first published story in Sanitarium Magazine, issue 28, which is out now. For those who haven't heard of Sanitarium before it is a monthly magazine that specialises in horror fiction, and also publishes articles and interviews. It's a great little read and well worth checking out.